A view you would enjoy swimming in! 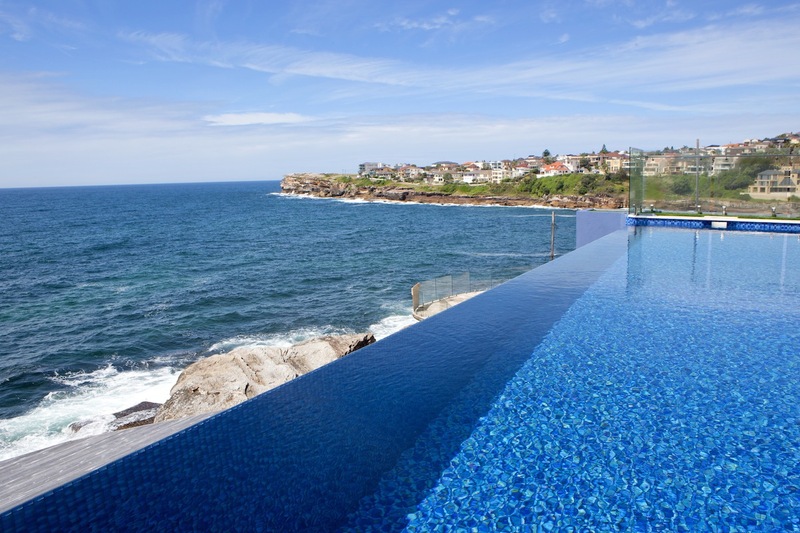 The ocean views from atop South Coogee’s cliffs are among Sydney’s finest, and are well known to Sunset’s accomplished wet-edge swimming pool design and construction specialists. 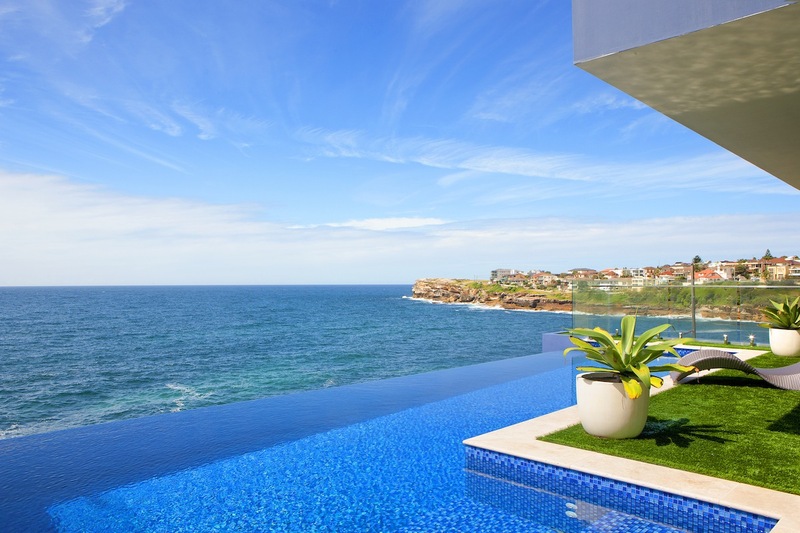 This outstanding Sunset pool was designed to embrace both practical and economical features plus capitalise on the existing and created aspects of its elevated oceanfront position. Sunset’s Gold Medal Winning solution takes full advantage of the site’s limited footprint and makes the most of the ocean view from its impressive thirteen metre (13m) wide wet-edge overlooking the breaking waves and the rocks below. The exposed wet-edge of any heated pool invariably compromises the installed heating system’s efficiency. Nowhere is this more evident than on an exposed ocean-front cliff face. This fact was central to Sunset Pools’ inventive solution that efficiently maintains pool temperature without increasing heating overheads or compromising the dramatic impact of a view you can swim in! Sunset’s aim is always to provide new pool owners with an integrated contemporary living space that goes beyond only taking advantage of its location and outlook. Discover Sunset Pools’ inventive solution to reducing ownership costs of a spectacular new wet-edge pool by completing the enquiry form or call today on 1300 000 412. Sunset wet-edge pools, sometimes called infinity or negative edge pools are best suited to setting off sweeping natural panoramas across the ocean and open sky. They can vary widely in character and size from exceptionally large freeform shapes to more regular compact rooftop installations. This is essentially a 1.8 meter deep rectangular rooftop pool with a large half meter (0.5M) deep swim-out opposite its imposing 13 meter long wet-edge. The wet-edge is constructed like a weir; during normal operation it remains just 50 to 60 millimeters below the pool’s coping allowing water to continuously spill over creating the captivating illusion that there is no discernable pool edge. Wet-edge pools rely upon fully automated top up hydraulics to maintain the wet-edge’s operation, plus non return valves and automated digital control systems to account for evaporation and rainfall plus guarantee flawless long term operation. Sunset Pools’ ingenious solution to the commercial grade pool hydraulics elegantly resolves the pool owners desire for the aesthetics of an authentic wet-edge pool without the inherent water heating costs associated with heat loss at the exposed wet-edge. Whenever the swimming pool’s gas heating is turned on the water sanitation and heating hydraulics automatically begin drawing water direct from the pool via a conventional skimmer box, then redistributes the heated water through no less than seven returns to eliminate cold spots. This efficient approach isolates the 10% water reserves held in the pool’s balance tank so that only the water within the pool itself is heated. The wet-edge overflow is simultaneously suspended, eliminating associated heat loss and saving these delighted Sunset Pool owners’ thousands of dollars annually on nonessential water heating levies. Wet-edge pool weir construction tolerances are by necessity demanding, less than a one millimetre (1mm) height tolerance is acceptable across the entire 13M tiled wet-edge. The pool’s interior, swim-out, wet-edge and balance tank are all finished with the owners own selection of specially imported glass mosaic tiles. Planning for the essential services was concluded during the site’s 5 month cliff-top excavation, and all water management, utility and C-Bus control connections were integrated before the double formed 40MPA concrete pool shell was poured and vibrated along with the residence’s other reinforced concrete structures. 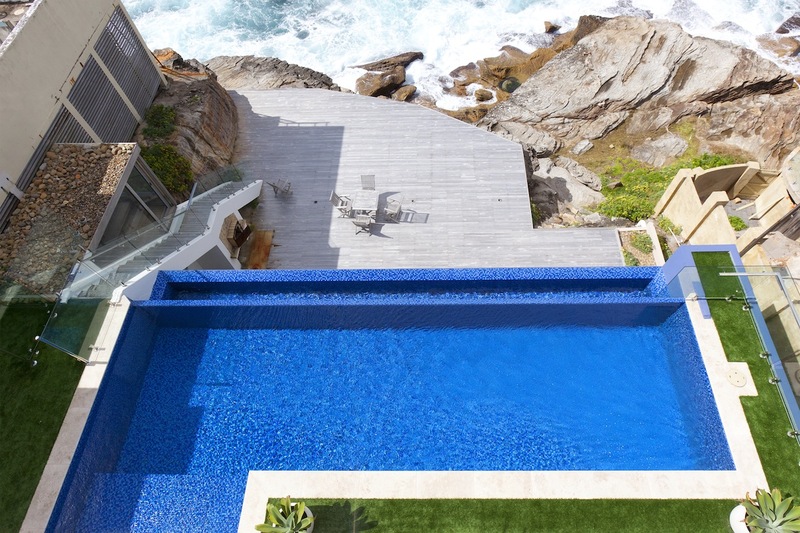 This pool has been built as an integrated element of this new ocean front home’s second level, and sits on top of the residence’s self contained guest accommodation and secluded entertaining area. Close cooperation with the developer’s architects and builders was essential as the swimming pool’s double steel form work incorporates several structural elements of its owner’s new 4 story home (and vice-versa). In addition to structural integrity it was also critical that the rooms below the pool would never be compromised by the large volume of water above. To ensure that the concrete pool shell remains watertight Sunset employed two coats of Cementitious waterproofing prior to rendering the shell’s interior, then following rendering waterproofed again with a Laticrete Hydro Ban silicone membrane. The shell was then flood tested at full capacity before the interior tiled finish was applied with waterproof epoxy adhesives and grouting. Sunset applied this triple skin waterproofing technique to all water bearing structures to guarantee that all susceptible areas of the home will remain dry. 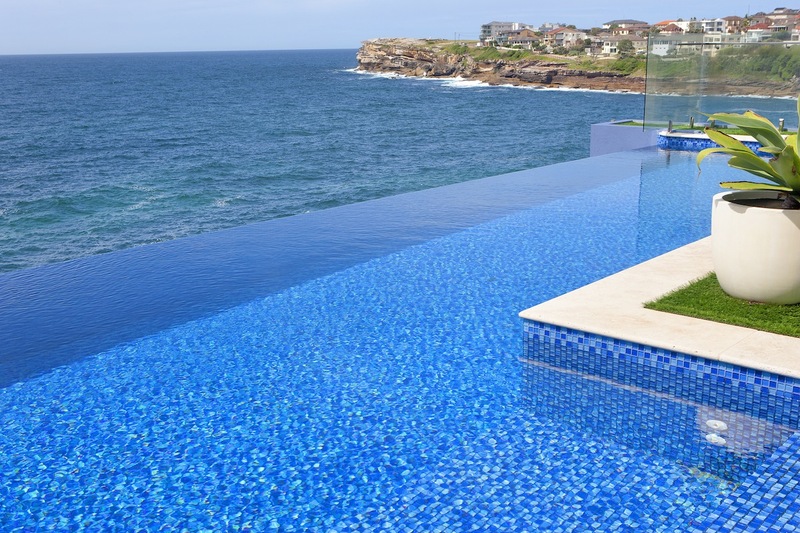 Sunset Pools is among a very select group of specialist Sydney pool designers with the capability, plus the sophisticated laser levelling equipment required to confidently tackle these challenging projects. 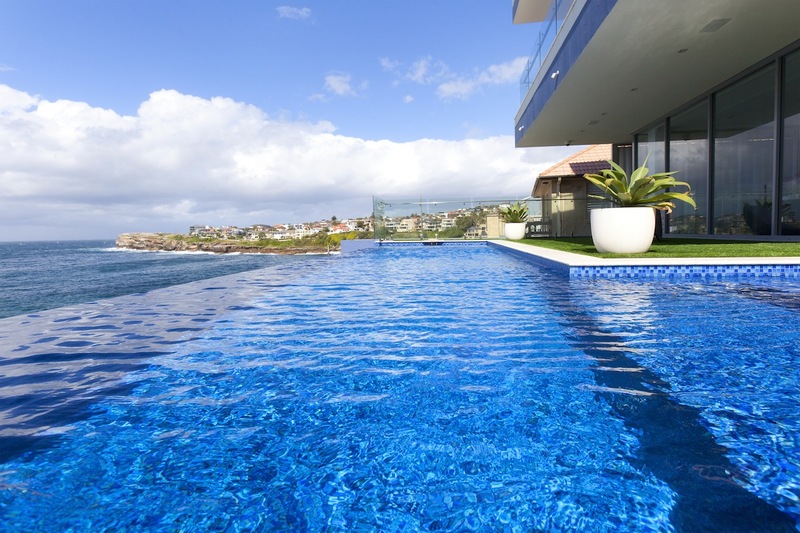 A wet-edge pool epitomises the ultimate in Sydney luxury living, Sunset Pools’ also appreciate that affordability must also be a practical consideration when realising your dreams. 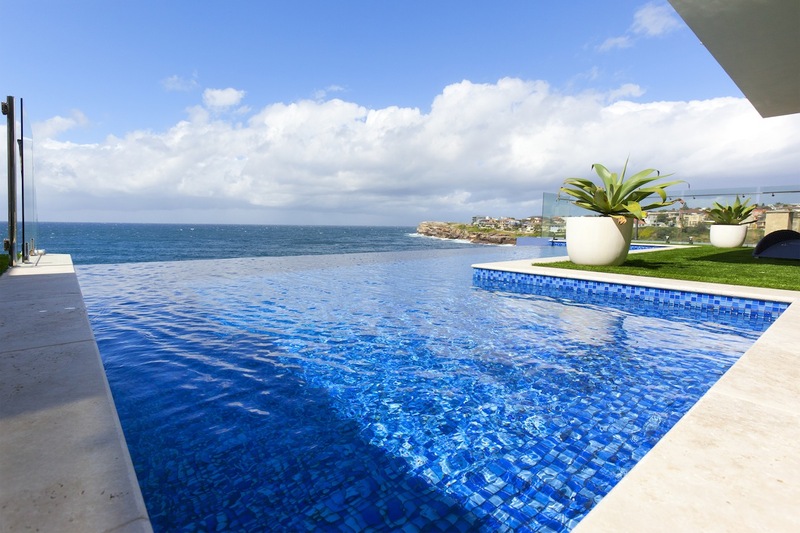 If you consider that your location’s potential would be compromised by anything less than a Sunset Pools wet-edge designer pool, complete the enquiry form to arrange a site inspection, or call today on 1300 000 412.